The first time I ate stuffed bell peppers was nearly twelve years ago, on Christmas Day, 2006. And it was the only thing I ate that day. To cut a long story short, we had been invited to a Christmas Day BBQ next to Bondi Beach, Sydney, Australia, and it was too much of a cool opportunity to pass up. Off we went and happily paid the suggested $20 to support the BBQ hosters. As I went to grab my food, I realised what we’d been invited to. A seafood BBQ! Even in my meat-eating days (why I gave up meat) I was no fish fan, and shrimps on a barbie certainly held no appeal. 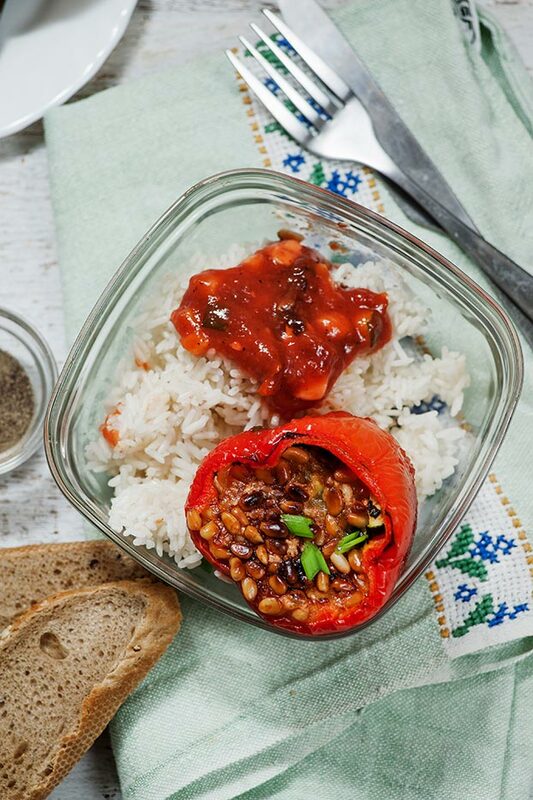 The only item that wasn’t slathered in fish was…you guessed it – a stuffed bell pepper. So I ate it. And another. And that, was Christmas Day dinner. It was a great day. The $20 also covered as much beer as I wanted. ‘Nuff said, really. Anyway, back to the bell peppers, and how to make them. They’re EASYYYYYY! Lop the top off and you’re good to go. Pretty much everything else gets chopped up and thrown inside. One memory that stayed with me strongly from my first eating of stuffed bell peppers was that they can get very dry (even with unlimited beer). 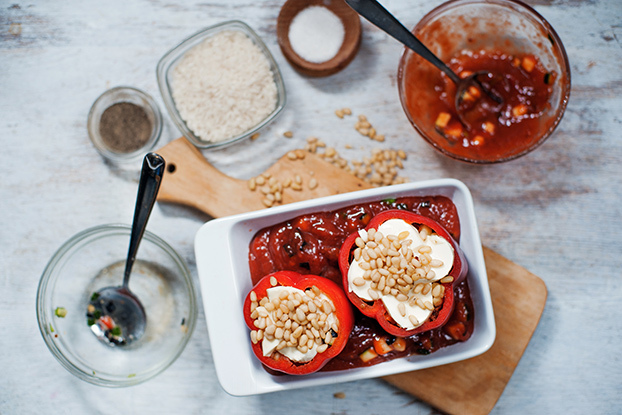 We’re going to cook our bell peppers in a simple yet tasty tomato sauce that keeps the peppers moist and elevates this recipe from being merely good, to fantastic. A stuffed bell pepper is a packed nutrient bomb! 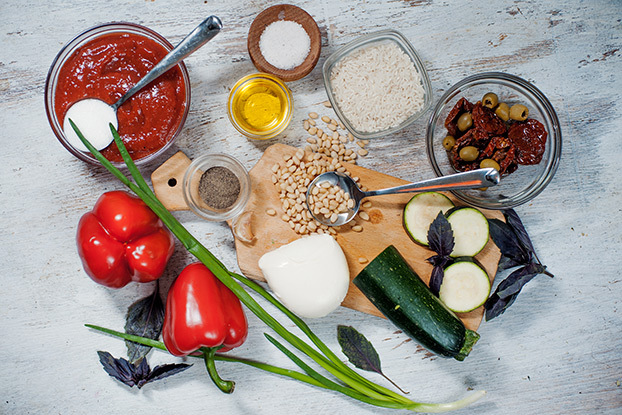 Peppers themselves are full of vitamins like A, B and C. Zucchini and tomatoes bring the potassium and manganese, the vitamin K and the antioxidant benefits. Mozzarella, olives, and pine nuts bring healthy fats, complete proteins (see our high-protein meal plan) and a whole lot of taste. 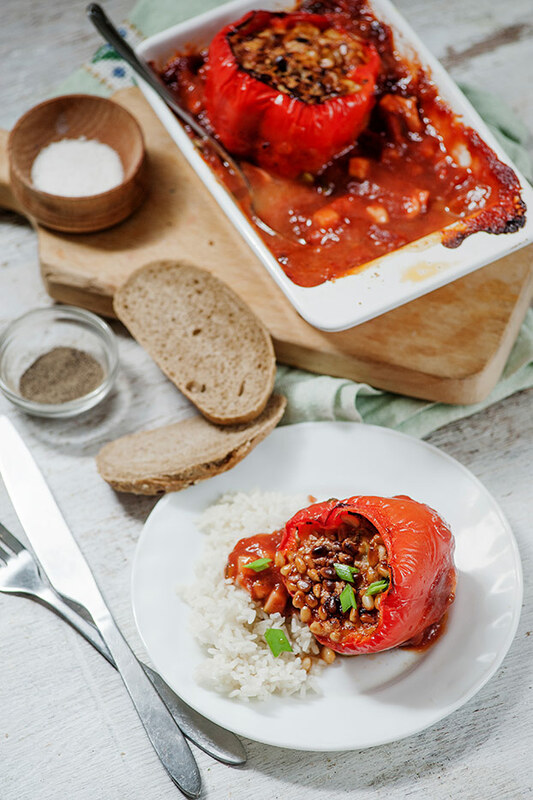 We prefer rice as the perfect side-kick to these lovely peppers, though you can use whatever you fancy (or have to hand). Roast potatoes, fresh baguette – pick your fave! 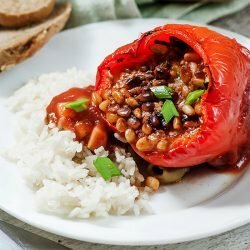 And finally – you can freeze these easy stuffed bell peppers if you want to make a bigger batch and save time in the future! 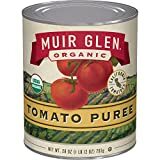 Cook any you want to freeze without the tomato sauce. When you’re ready to reheat the frozen bell peppers, simply make the sauce, pop in the peppers and reheat in the oven until hot through (about twenty minutes). PS. Breakfast in Six is now out! All exclusive, all vegetarian – 30 amazing recipes you can’t find anywhere else. Take the power back at breakfast. 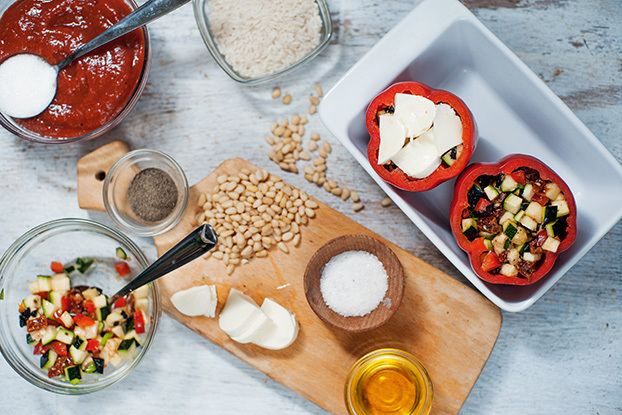 Easy Stuffed Bell Peppers baked in a delicious tomato sauce - foolproof instructions and packed with vitamins and nutrients - bring the health back! Cut the top off the bell peppers. Scoop out the seeds and white bits. Dice the zucchini, dried tomatoes, olives, spring onion and garlic. Also, slice off any extra bell pepper from the tops and use, you're not going to need those again. Throw everything into a bowl. Dice the mozzarella and add half to the bowl keeping the rest as a topping. Drizzle olive oil onto the mix. Add the chopped basil and salt and pepper. Give it all a good stir. Add the mix back inside the peppers. 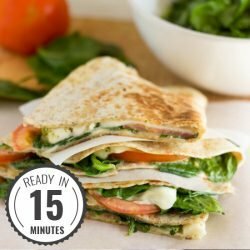 When full, layer over the rest of the mozzarella. If it doesn’t all fit, don’t panic. You can add any leftovers to the sauce. Sprinkle the pine nuts over the top. In a small casserole dish pour in the tomato passata, adding the olive oil, sugar, salt and pepper. Have any filling left that didn’t fit? Add it to the sauce and mix well. Now place the bell peppers upright in the sauce. Off it goes into the oven for about 40 minutes. Bigger peppers might need a bit longer, and smaller peppers, less time. Use the baking time to cook the rice, according to packet instructions. After 40 minutes, all will be ready. Enjoy! Don’t be scared about a long looking list of ingredients. 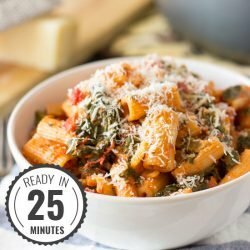 This dish is mega easy to make. Same goes for the instructions - the steps are really simple! These are very yummy. Just a couple of comments – where it says a “ball of mozzarella” I had to guess how much. Is a ball an actual standard size in some countries? (I am in Australia). Also you don’t specify what type of olives, I used kalamata. Next time I will add a finely chopped chilli to the filling mix. Also change to half mozzarella and half parmesan for a bit of extra flavour. But overall these are delicious!! I served them with rice and some broccoli. Thanks for the recipe. The chilli sounds excellent! Parmesan would be too, I’m sure. For us it’s a no – parmesan is not vegetarian in Europe (it contains calf rennet) but often in the US it’s made with artificial rennet. Maybe it’s the same in Oz (if that’s important to you). Really happy you enjoyed it, Liz!